The design industry is careering towards a defining junction. Our job titles are all over the place, our career paths changing month by month and, to be honest, most people still don’t know what we do. Have you tried to explain what a product designer does recently? The more we wireframe, the more we organise components, the more we represent customers, the more we strategise, the more we liaise with engineers, and the more we write copy, the less we feel like designers and the more we act like product managers. Dial your memory back to when you first fell in love with becoming a designer. For most of us, it was cracking open Photoshop and trying to imitate the design of a website we liked. It was those early exertions of flair that got us hooked, and that exposure to creating something visual which made us realise there was a career in being artistic by nature. It might be useful for me to define (product) ‘designer’ at this point. A designer, in 2018, means more about your ability to ‘think like a customer’, or solves problems, or produce work that holistically answers a business case to increase revenue than your ability to make something pretty. A designer is not someone, anymore, that is leading with creative licence. When working on products, in the ‘move fast, break things’ mentality, you rarely have the opportunity to stretch your artistic muscle; you’re more likely spending time reorganising existing components of a system, or feeding data into a low-fi series of screens. Designers are now used to working more with grey boxes than the Photoshop filter bar. A more common scenario for us (product) designers now is that we will scope projects out as a team, open up our preferred tool and get to work on building a flow diagram, then sync up our styleguide kit to work out what components we already have that can match the goals, altering the data to produce this ‘new’ screen. Note how at no point in this scenario was there a requirement to ‘design’ something new, but reorganise what we already have. My question is this: why is a designer required to perform this job? With engineers preferring to lock down the development of new components, opting to reuse existing patterns, and product managers being forced to script stories out to the nth degree, what need is there for creative licence? Are we not in a position where the creative thinking is required at story time, rather than design time? I’m sure you have been in a position where you’ve found one of your beautifully crafted designs adjusted by a product manager for a particular story, because the copy wasn’t correct or a piece of data was missing — there’s nothing wrong with this, and we should be less attached to our work, but this is a different article’s worth of comment — why shouldn’t this whole process be handled by that person? If the complexity of a project increases with every touch point, and the product manager owning the projections, it could be their entire responsibility to deliver. This is especially true in data-complex projects, where product management is technically minded. As designers work progressively closer to the end user, shaping business problems and ultimately the final product, we are at the cusp of an industry shift towards teams being split into engineers and product. 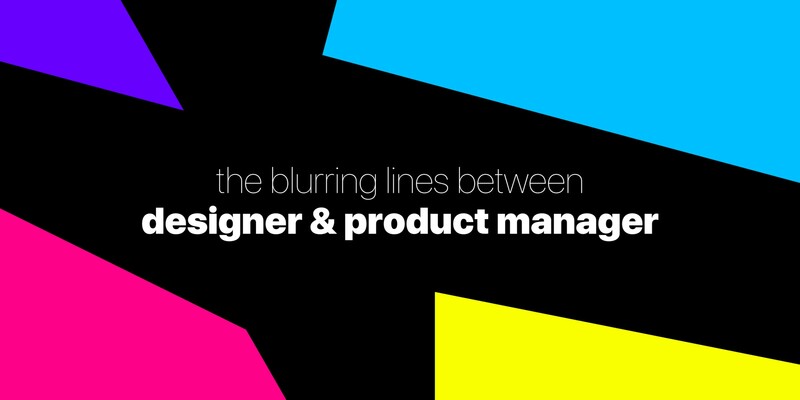 I anticipate is a merging of the designer and product manager roles, to a wholesome ‘product’ position, where we’re contributing to all aspects of the delivery cycle, not just the screens. The sophistication of design tools is helping us make this a reality too. With the merging of design and development tools, thanks to the hard work of very clever folk, we’re given freedom to spend even less time inside the tools and more time planning, strategising and shaping. Designers are curious in nature, and we should be harnessing this to propel our careers into the next stages. My opinion is that the current product designer / user experience designer position would benefit greatly from a closer relationship to product development as a whole. We should be actively pursuing the research, ticket-writing and technical discussions that our product managers do on a daily basis, and ultimately seek to own the entire product process. The roles will shift, merge and alter to the point where, in my opinion, there are not two roles responsible, but one — you. Enjoy this post? I run a weekly newsletter, Milk, No Sugar, where I’m trying to remove small talk one newsletter at a time. I share articles, videos and galleries every week, from the eye of a designer. Join 528 others. Design honcho @UpgradePack. Newsletter writer, co-host @thenoisepod, creator of @8pxmag, @juniordesignjob, @LondonIsYours. Curry addict.